Thiazide Overdose is the accidental or intentional intake of the drug in dosage higher than prescribed values. What are the Causes of Thiazide Overdose? What are the Signs and Symptoms of Thiazide Overdose? The signs and symptoms of Thiazide Overdose can vary from one individual to another. It may be mild in some and severe in others. Several systems of the body may be affected. How is First Aid administered for Thiazide Overdose? Who should administer First Aid for Thiazide Overdose? 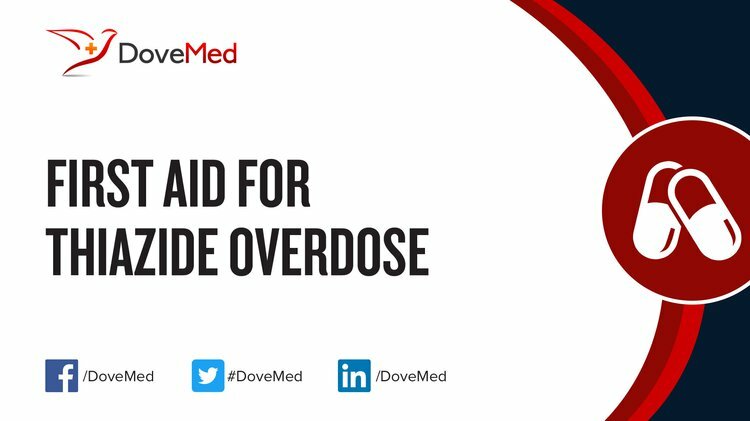 First aid for Thiazide Overdose is administered by healthcare professionals. What is the Prognosis of Thiazide Overdose? How can Thiazide Overdose be Prevented? Akbaş, E. M., Güngör, A., Timuroğlu, A., Ağgül, H., & Akbaş, N. A Hypercalcemic Patient With Malignancy, Hyperparathyroidism, Hypercalciuria and Vitamin D Overdose; Management and Brief Literature Review. Gill, S., & BCCA, G. BC Cancer Agency Management Guidelines Management of 5-fluorouracil (5FU) infusion overdose. Thomas, S. H., Bateman, D. N., Gray, A., Kevern, L., Goddard, J., Masson, P., ... & Eddleston, M. (2014). Common complications of poisoning. Oxford Desk Reference: Toxicology, 63. Satoh, F., Okado, T., Iwamoto, M., Akita, W., Wakabayashi, M., Ohta, A., ... & Sasaki, S. (2010). Calcium-alkali syndrome-like symptoms manifested by daily alphacalcidol and thiazide. Internal Medicine, 49(9), 837-840. Burkhalter, F., Forster, C., & Dickenmann, M. (2010). Hypoventilation: a risk factor for milk alkali syndrome?. BMJ case reports, 2010, bcr0520102966. Shastay, A. (2017). Accidental Overdoses Involving Fluorouracil Infusions. Home healthcare now, 35(4), 226-228. Zahedi, K., Barone, S., Xu, J., & Soleimani, M. (2013). Potentiation of the effect of thiazide derivatives by carbonic anhydrase inhibitors: molecular mechanisms and potential clinical implications. PloS one, 8(11), e79327.